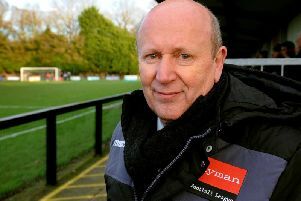 Ian Chapman said Burgess Hill Town’s Sussex Senior Cup exit was ‘embarrassing’ for him. And he said the players should be embarrassed as well as former striker Rob O’Toole scored two to give SCFL Premier side Saltdean United a 2-0 win. The Hillians were forced into making changes from the side who beat Tonbridge on Saturdayt with Gary Elphick, Stephane Ngamvoulou, Lee Harding, Sam Fisk, Ibrahim Forfana and Conor Tighe all missing from the starting line-up due to being cup-tied or injured. Chapman’s assistant Stuart Tuck started but was was shown a red card after two bookings, one of which led to a penalty for Saltdean’s first goal. Chapman said: “We never got to grips with it really and the players who came in didn’t do themselves justice, it was a real disappointing performance and we deserved to go out. “We didn’t take the game lightly, everyone who was available was in the squad unfortunately. “It was embarrassing for myself and the players should be embarrassed because we deserved to get beat. The Hillians are back in league action on Saturday when they face Hendon at the GES. Chapman is expecting Tony di Bernado, Elphick, Fisk, Ngamvoulou, Forfana and Tighe to be back for Saturday.